The modern State of Israel with 1949 boundaries (Compare with the kingdom of David and Solomon map). When the birth of the State of Israel was announced the flag of David was raised. The flag was the traditional shield emblem of David, two triangles...one pointing downward toward the Land of Israel and the other pointing upward toward God. The triangles were blue on a white background. Two blue stripes were also added and commanded to be on Israeli clothing as well, to remind them to obey God's commands. When the flag was raised the Arabs rallied an attack outnumbering the Jews 100-1 in people, 40-1 in troops, 1,000-1 in military equipment, and 5,000-1 in land. When Britain left Israel the Jews were on their own with 1 rifle to every 5 soldiers and no artillery. Palestinian guerillas were nearby when they heard the news, they organized along with Egypt, Jordan, Syria, Lebanon, and Saudi Arabia. Their ultimate goal was the extermination of every Jew in the world. The Arab general proclaimed, "This will be a war of extermination and a momentous massacre which will be spoken of like the Mongolian massacres and the Crusades." The world was watching and were astonished to see the Jews winning on every front, the Arabs retreated back across Israel's borders, the Syrian tanks were stopped at Degania, the Syrian guerilla leader was defeated at Sejari, and the Egyptians were routed at the Negba. The Arabs called for a truce, regrouped and immediately broke the truce and attacked again but were harshly defeated again in Gaza, by air and sea. The Syrians also broke the truce and attacked, and were quickly defeated in 24 hours in the Galilee area. The Americans had to Intervene to stop the angry Jews from their advance to Saudi Arabia. The Arabs were utterly humiliated and by February of 1949 Egypt, Lebanon, Jordan, and Syria began signing armistice agreements with Israel. Israel's territory exceeded 8,000 square miles, but the borders were never to be considered permanent with such hostile neighbors. 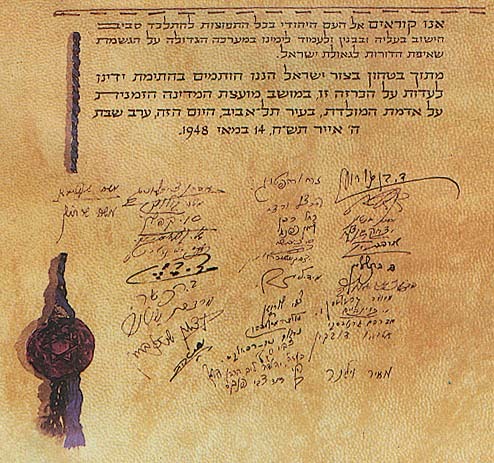 On May 14, 1948, on the day in which the British Mandate over Palestine expired, the Jewish People's Council gathered at the Tel Aviv Museum, and approved the following proclamation, declaring the establishment of the State of Israel. The new state was recognized that night at 11:00 AM Israel time by the United States and three days later by the USSR. "ERETZ-ISRAEL (the Land of Israel) was the birthplace of the Jewish people. Here their spiritual, religious and political identity was shaped. Here they first attained to statehood, created cultural values of national and universal significance and gave to the world the eternal Book of Books. PLACING OUR TRUST IN THE ALMIGHTY, WE AFFIX OUR SIGNATURES TO THIS PROCLAMATION AT THIS SESSION OF THE PROVISIONAL COUNCIL OF STATE, ON THE SOIL OF THE HOMELAND, IN THE CITY OF TEL-AVIV, ON THIS SABBATH EVE, THE 5TH DAY OF IYAR, 5708 (14TH MAY,1948)."